Here is the concept that began the Bill Series of Paintings (in which there are still about 3 more to paint). I had heard a sermon about the man and the broken vessel. 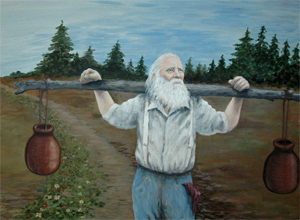 In this story a poor old man walked down to the well everyday to get his water. In these long journies down to the well, he struggled with one of the clay vessels that had a growing crack in it. Too poor to purchase another, he kept repairing the vessel as well as he could. One day when the vessel was entirely dry by the return to his home, the man sat on a stump in dismay and lowered his head. As he slowly looked upward he glanced at the dry ground and then noticed a flower. A smile grew onto his face to discover that along the entire trail where the vessel had leaked - one drop of water at a time had nourished the ground just enough to spring up the flowers that lay under the dirt waiting to grow. It was then that that the old man realized that sometimes we can feel dismayed about our accomplishments - not realizing how we touch other lives in the world and make a difference. I loved the sermon and was determined to find the "right" person to paint for this analogy. 1 1/2 years later I met Bill at the hardware store. I asked him if he would be interested in being my model and he agreed. Its been a great project that led to a great friend. Price: To be announced in future.